No workshop should be without levels in various lengths, but for lines longer than 3′ or 4′, traditional bubble levels don’t work well. Enter the laser level. 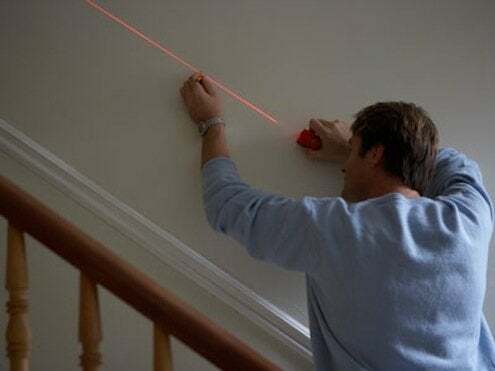 For between $15 and $100, a fixed laser level throws a level red beam against a wall or floor, which can be used as a guide for framing, trim, shelves or any numbers of projects where you need a level line over the width of the wall. For projects requiring a level line spanning around the entire room, you’ll need a rotary laser level. These cost more, between $200 and $1,000, and are usually mounted on a tripod in the center of the room so they can cast a 360-degree laser line around the room, like a super accurate chalk line on all four walls. It can also show a vertical line hitting walls, ceiling, and floor simultaneously, for a super accurate plumb line. This can come in really handy if you’re framing a irregular space, like a basement, where you can’t use the existing walls as a reference.